“Battlefield Banners: Flags of the American Civil War.” Instead of focusing on the “national” flags, I thought it would a positive experience to learn about some of the colors carried by certain units – regiments, brigades, etc. What did that particular flag symbolize to the men who carried into battle? Was there something on the flag that symbolized home? Each blog post will address a historically broad topic of military colors, introduce a historical Civil War flag, and summarize the history of the unit which carried that flag. I hope you’ll enjoy learning about some of the unique, beautiful, and patriotic banners created in the 1860’s. Why Carry A Flag On A Battlefield? A flag served several purposes on a battlefield. Communication, direction, and organization. Remember, these are the days before radio and extremely long-range projectiles. Armies were still marching and fighting close to each other. Flags were important for communicating the fact of friend or foe on a smoky battlefield and – reminiscent of heraldic tradition – were a rallying point for the men. Try marching three hundred people in a line across a field. You probably can’t keep a perfectly straight line. A flag became a sort of moveable guidepost, helping to maintain good order in the march or attack lines. Organization – a flag helped to keep men of the same unit together. Usually the flag was in the advance or center of a line. If a soldier could see his flag, he knew he was were he was supposed to be. Coined in Latin as the Virginia state motto during the America War for Independence and placed on the imaginative seal depicting the goddess of Virtue crushing a Tyrant, the phrase translating “thus always to tyrants” illustrated the state’s value on the independent spirit. The phrase and it’s meaning took different meanings between 1776 and 1861, but remained part of Virginia’s ideas and culture. In 1861, a flag was commissioned and made in Richmond, Virginia for the 2nd Virginia Infantry Regiment. Though paid for by a wealth man of the county, he didn’t want recognition for his deed and insisted that the ladies of the area present the flag to the unit. The flag was given the day before the regiment left and was carried at the front of the brigade. The flag itself survived the first battle and was given to some civilians for safe keeping when new flags were issued to the brigade. Now the flag is preserved and displayed at Virginia Military Institute’s museum and archive. Meet the 2nd Virginia Regiment, the Confederate unit who received and carried the flag described and pictured above. The regiment was organized in April 1861 by men in the northern part of the Shenandoah Valley for the defense of their state and region. 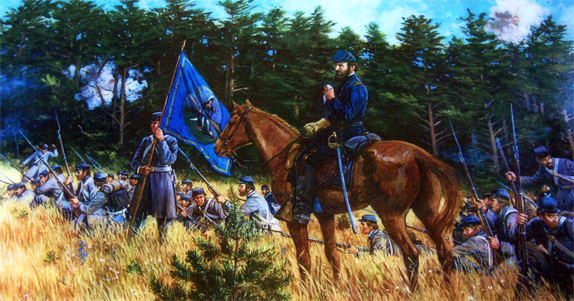 Shortly after muster, the regiment was incorporated into the 1st Virginia Brigade, under the command of Colonel (later General) Thomas J. Jackson. The 2nd was the only unit in the brigade to have a flag at the first major battle (First Bull Run / Manassas), so their flag was used by entire brigade. At the Battle of First Manassas, the 1st Virginia Brigade got the nickname “Stonewall” for their steadiness under fire on the Henry House Hill. The 2nd Virginia Regiment (as part of the 1st Brigade) fought in many battles in the following years of war: Valley Campaign of 1862, Seven Days Battles, Second Manassas, Fredericksburg, Chancellorsville, Gettysburg, Spotsylvania. Sixty-nine men of the 2nd Virginia Regiment surrendered at Appomattox Court House in April 1865. Battlefield flags were used to organize, guide, and communication within a regiment. 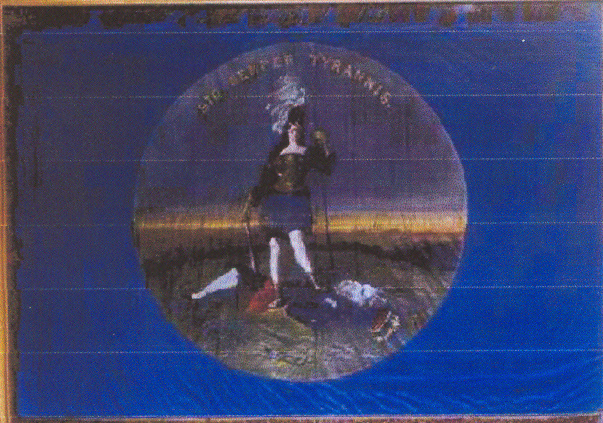 The flag of the 2nd Virginia Regiment (and used by the 1st Virginia Brigade) at First Manassas represented the ideals of self-government and state independence that Virginians valued in the 1860’s. P.S. Do you have a favorite regimental flag from the Civil War era? The gallant white silk of the 11th N.Y. Fire Zouaves! Huzzah! and a Tiger–grrrrr! THE 36 VA. INF PROUD FLAG AND THE STORY WITH IT .